Feldard nodded to the unthreatening figure but continued loading his bolt. “On your way through the room, see if you can feel for my axe,” he called out to the former prisoner. He grunted with the effort needed to pull back the crossbow, then set the safety. Yousef had disappeared in the room. “Don’t dawdle in your search. I’ll need your help walking.” He was loathe to leave his axe, but his friends might need him. He could always return and find it after the yellow-robed man had been found and dealt with. Hasan rejoined the wordless, soundless fight. Seeing the man entangle himself in the statue, he waited for the perfect moment. When the jackal’s head lifted up in exertion, the elf’s sword whistled horizontally, carving a gleaming arc through the air, punctuated by a shower of quartz-like at its apex, where the sundered neck had been. The statueman collapsed, and Stephan drove it into the ground. The warrior choked as the it disintegrated into powder. Miklos ached. The vicious blow from the first magical assault had taken him off his feet and almost dashed consciousness from him. His head swam for a moment as his body registered the burning puncture holes. Thankfully his sharp cry silenced by Maruc’s spell. Still, he didn’t doubt the wisdom of the cleric for an instant the spell had saved his life. He looked down at his robe. He sighed, that was going to take some fixing. He slumped back against the wall. He felt far too shaky to stand. 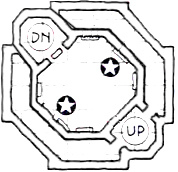 Maruc caught Hasan’s attention and gestured him to help Ludo look for a way forward – the most sensible place to start being opposite to their entrance point as all the previous room in this tower had been designed. He then went over the Miklos and checked his wounds. It was fortunate Yousef had got here in time. Things could have turned out very differently. He spent a few moments binding Miklos. The scotch marks left very little to sew so he did what he could and knew without the aid of Immortal Halav this man would succumb to infection. Ludo rushed through to the back of the room where he had heard the sounds of magic being invoked. He looked at a painting, a portrait of one of the jackal men, and saw that there were two holes cut in the painting in place of the creature’s eye. Ludo did not hesitate. He slashed his sword across the painting then jumped into it. As he had suspected, there was no wall behind the painting. The magic user had been hiding here to cast his spells upon them. He saw the evil mage, with terror on his face, from being discovered and knowing that his magic would not work from the enchantment placed within the room. He was already fleeing up the stairs. From habit, Ludo yelled “Surrender you fiend!” and was a little surprised that he did not hear his own words. Ludo, pursured the fleeing mage. He knew he had to catch the mage before he had time to turn and cast more spells. As he ran, he drew his dagger and threw underhanded at the retreating back of the mage, unfortunately it missed and clattered against the wall of the corridor. A thought flashed through Ludo mind, he heard the knife clatter, he was outside the spell of silence, things could get ugly now. The good news was that he was fast approaching on the wizard. Again Ludo yelled out “surrender or die”! Ludo hoped that the rest of the group was close behnd. Satisfied that he had done the best he could for Miklos, Maruc lept to his feet summoning the final spell he had in his arsenal. He hoped it would be enough to stop Golthar. He sped after the rogue pausing only brifly to pick up the coin. There probably very little power left to the enchantment but he hoped it was enough. Ludo was already mounting the stairs two at a time. Maruc was just behind him. Miklos was groggy with inexplicable tiredness. He tried to get his feet under his weight but struggled as his knees gave out. He idly wondered where Feldard had got to. This stone floor was cold and his eyelids felt heavy. Maybe just a small rest, he thought, then he would feel better. Miklos slumped into unconsciousness. hasan joined the pusuit of thefleeimg mage, envying Ludo’s lightweight armor as he pushed ahead. The elf sheathed his sword and readied an arrow as he ran. * he will take a shot at any chance … regardless of ant ‘to hit’ penalty. Stephan was worried about Miklos but saw the Maruc had done what he could. He followed the others in the chase of Golthar the Fiend. ‘But to not have Miklos with us….’, he worried to himself. ‘You fight a mage with a mage, is what old Protner used to say back in his militia days. He tripped on one of the steps, losing a half beat of time. This focused his thoughts to the pursuit and he continued up the stairs. Yousef tried to argue with Feldard about going after the others but the dwarf with his heavy scowl quickly silenced the complaints. Leaning heavily on Yousef, the dwarf got to his feet, nearly blacking out in the attempt but still refused to see the truth of the situation. Together the two made their way back into the enchanted room. The gods must have been amused and favored the dwarf and his stubborness, because mid-way through he stumbled on his axe, which they picked up before continueing on towards the steps.